So I got an Ultimate decorating kit for Christmas, and I started playing with the rose making tools for fondant. I made an easy tutorial so you can make beautiful roses with fondant too! I made a New Years cake with the beautiful roses. First off, you need fondant. You can by some from Michaels or make your own. I made a marshmallow fondant that can be found here. I read online that you need wires for the roses to dry on, but I just used toothpicks and a styrofoam block. So lets begin making roses! They are quite simple. 1. 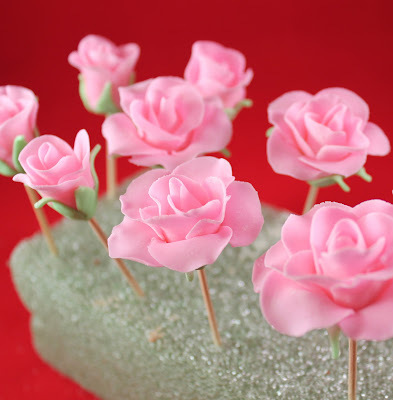 Make small tear drop shapes fondant pieces and stick them on the toothpicks. Allow them to dry for an hour before moving on to step two. 2. Roll out the fondant as thin as you can. The thinner it is, the more realistic the flower looks. The fondant should almost be transparent. Cut out several pieces using the rose cutter. 3. Make five 1/4 inch long cuts in the rose at each petal. Place one of the pieces on the thin foam. Using the balling tool, with half the ball on the fondant and half on the foam, gently roll the edges of each piece so that it thins out the rose petals. 4. Poke the center of the rose piece with one of the toothpicks. Then wrap one of the petals around the teardrop. 5. Alternating between the petals, wrap the rest of the petals around the tear drop. Brush on a little water to help make it stick. 6. To make a bigger rose, add a second layer of rose petals to the rose bud just like above. Remember to use the ball tool again. Alternate between petals again. 7. To make a full bloom rose, add another layer, for a total of three layers. 8. Roll out some green fondant and use the second cutter. Using the balling tool with thin foam, roll from the edge to the center of each piece. 9. Hold the flower upside down, push the green piece through the center on to the toothpick. Slide it all the way down to the flower, apply some water to attach. I hope this tutorial helps you make beautiful roses too! They are beautiful! Thank you so much for sharing this! I can't wait to make some! Great tutorial, Your roses are beautiful! So pretty! Do you take them off of the toothpick? Or just insert it into the cake? I honestly just stab the toothpicks into the cakes. I never tried taking them off in fear of breaking the petals after they dry. Thanks for master class. Your roses are beautiful. They look great! Better than other I've seen online. How long can they keep for? And how would you store them? Hi Bella! I always make these roses a day before I need them on a project. They are fragile, so I like to leave them on the toothpicks in the styrofoam block until I need them, which is usually the next day. Then I pull the toothpicks out carefully, and glue them on the cake with royal icing, etc. I had extra roses before. I leave them in tupperware boxes with soft foam or bubble wrap on each layer. I store them at room temperature. I used them 2 months later, and they were still yummy. So I am not sure how long they can stay. My guess is forever, like royal icing lay-ons. Thank you very much for sharing this tutorial. Your roses looks amazing! Thanks thanks thanks, a million thanks! This will help me out as a beginner. I think I could cry right now! I'm a Pastry Chef that sadly could never make these. My focus is restaurants but I've always had a love for cakes. Thank you thank you thank you! Thank you so much for sharing . The step by step pics are great. @Anonymous Hi! For a single rose, I use the same cutter. I just use my balling tool more on the outer petals. If I want a smaller rose, then I use a smaller cutter. I dont switch between sizes when making a single rose. Hope this helps. Thanks so much for this privilege. God bless you. Can't wait to try mine. Where did you get the cutters-I love your roses! Want to try these. Hi. The cutters are made by Wilton. You can probably get them online. I've also seen them at my local Michael's Craft store. It's called the "Stepsaving Rose Bouquet Flower Cutter Set" Hope this helps. Wow!!!! This is so easy. You have saved the wedding day. Best tutorial I have ever found!!! Beautiful. Thank you so much. I've got all the stuff to give marshmallow fondant a try!